was the 145th running of the event which uninterrupted by war or weather the sprint handicap race has taken place on or around New Years Day every year since it was first won by Jedburgh’s Dan Wight in 1870. Throughout the years the race has had a few different venues but no matter where it is run, it is always referred to as the ‘Powderhall’. The race took place at the Powderhall Stadium in Edinburgh up until 1957 with the exception of 1953 when it was held at Old Meadowbank, from 1958 until 1964 venues at Hawick, Tranent and Newtongrange hosted the event before it returned to Powderhall for a further six years culminating in 1970 with Scotland’s greatest ever sprinter George McNeil winning the Centenary running of the race in 1970. 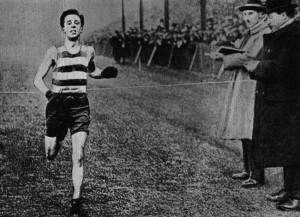 The Mile race has been held since 1870 with only three individual years omitted plus the five years of the second world war. It has been won off scratch only three times in its history, the first was in 1870 when JS Ridley of Gateshead won the race, in 1975 WS Gray of Livingston was the victor and in 1994 C May of Liverpool was first finisher. Other than that The only winner off less than 10 yards was Michael Glen of Bathgate in 1953 off 5 yards at Old Meadowbank. The race has taken various formats but the strangest feature for me is that t has not always been a Mile! It is listed as over 880 yads/800m up to 1 Mile/1600m and for the first 100 years it was a Mile Open Handicap race. Then in 1971 there were two races – one a 1600m Open Handicap and the other a 1000m Open Short Limit Handicap. The first was won by D Minto and the second by RM Cuthbertson. They were held at Meadowbank and the fast track ensured fast times of 4:08.4 and 2:28.05 off 80m and 10m respectively. This pattern of two races continued until 1990 whereafter it became a 1600m open handicap and it has remained so. If we go up to Two Miles, which is described as over 1600m/1 mile up to 3200m/2 Miles, it was first run in 1871 and there are only 35 results for the distance listed on the official website of the New Year Sprint. It jumped from 1871 to 1916 for the second race then to 1923 for the third running. Thereafter it went to 1924, 1925, then 1946 and then 1972 when (apart from 1993) it continued to date. The race itself was a Two Miles Open Handicap until 1972 when it was a 3200 open short limit handicap and the following year it was a 3200m open handicap race. This stayed the case until centenary year of 2000 when it became a ‘One Lap (race. Up a distance again, and we get ‘Long Distance (Over two miles)’ races. These events had a comparatively short life in that the first, a 15 Miles, was in 1913 and the last, a 10 Miles, was in 1942. These races were all called Marathons. George McCrae won the first race but no time was given, The following year, the race was won by J Smith of Peebles in 1:28:43 and no time was given for any winners until 1919 when in the first year that the race was run at 10 miles, the victor was TG Shaw of Edinburgh in 49:49 with a start of 3 laps 350 yards. A bit daunting for anyone more than three laps behind at the start! The following year the winner was timed at 50:47 off 4 laps 50 yards. Thereafter they organisers went back to time handicaps rather than distance handicaps. Thanks for that detail, Alex. One of the attractions of Powderhall has been the fact that it is purely a running meeting. When I first persuaded the British Milers Club to hold one of their Grand Prix meetings at Scotstoun, I was approached by several who said that they really enjoyed a meeting where there were only middle distance races – 8 x 800m for men, 3 x 800m for women, 5 x 1500m for men, etc, and there is no doubt that track events with the clear-cut immediate winner has a different attraction from the extended and often fascinating field event duels. The New Year Sprint had only running events. They were all open handicap races where everyone had a chance to win. It was also helped by the timing of the event – midwinter has always been a time for festivals of various sorts from the Roman Saturnalia to the Christmas celebrations and in Scotland the New Year was the high spot of the winter. People in a good mood, with the betting associated there was a chance to win back some of the money spent over the holiday period – so long as you had some spare change to invest with the bookie. The Welsh tribute was sincere and they made a real effort to live up to the Scottish example: unfortunately they faltered but the New Year Sprint meeting goes on in Edinburgh.